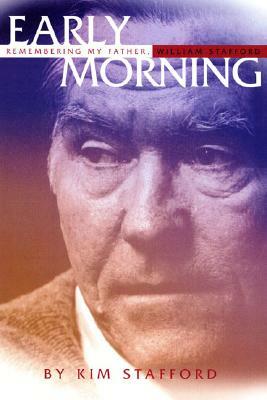 A prolific writer, a famous pacifist, a respected teacher, and a literary mentor to many, William Stafford is one of the great American poets of the twentieth century. His first major collection--Traveling Through the Dark--won the National Book Award. He published more than sixty-five volumes of poetry and prose and was Poetry Consultant to the Library of Congress-a position now known as the Poet Laureate. Before his death in 1993, he gave his son Kim the greatest gift and challenge: to be his literary executor. In Early Morning, Kim creates an intimate portrait of a father and son who shared many passions: archery, photography, carpentry, and finally, writing itself. But Kim also confronts the great paradox at the center of William Stafford's life. The public man, the poet who was always communicating with warmth and feeling-even with strangers-was capable of profound, and often painful, silence within the family. By piecing together a collage of his personal and family memories, and sifting through thousands of pages of his father's daily writing and poems, Kim illuminates a fascinating and richly lived life. William Stafford was born in Kansas in 1914, and published over fifty books of poetry and prose. Kim Stafford is a writer and director of the Northwest Writing Institute at Lewis & Clark College in Oregon.